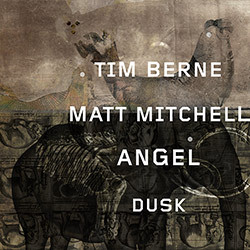 Angel Dusk features the duo of alto saxophonist Tim Berne and pianist Matt Mitchell, meaning it is a member of a comparatively rare format, the unaccompanied saxophone-piano duo; the Steve Lacy-Mal Waldron duo springs to mind, but precious few others. Fortunately, Berne and Mitchell have history together, with the pianist having been a founding member of the saxophonist's Snakeoil group ever since the 2012 ECM album which gave that quintet its name. In addition, Mitchell's 2017 solo album F�rage, released on Berne's own Screwgun label, consisted entirely of his versions of Berne compositions. If that sounds rather too Berne-focused, it is worth remembering that Mitchell had prior experience in bands led by such luminaries as Dave Douglas and Steve Coleman. By comparison, Berne has led his own groups since the late seventies. Despite their past relationships, in the context of this duo, Berne and Mitchell are undoubtedly equals, with neither being the leader or playing a support role, and the two of them collaborating to shape the improvised music. The album consists of eight tracks, ranging in length from two-and-a-half minutes to just over twelve, a total of almost forty-six minutes. Remarkably, a sleeve note says that the album was recorded on November 16th 2017 at Octaven audio, "in a couple of hours". That fact alone speaks volumes about the mutual understanding and empathy between the two players; without it, recording the music here would have taken far longer than two hours, with countless discarded takes. Right from the start of the opening track, "Perception/Reception", the album's longest, the music flows continuously and freely from both players; they each play all the time, subtly shifting what they play in reaction to one another. Consequently, the way in which a piece begins gives no indication of how it will sound at its conclusion; for instance, that opening track has a mellow, reflective opening but evolves to end with a jaunty unison passage. Across the eight tracks, there is enough variety and contrast to engage listeners' interest and keep them on their toes, guessing what else is in store. Endlessly fascinating.